As sharp and divisive polarization continues to define American politics, an election night survey shows that American Jews remain deeply entrenched in the Democratic Party. From immigration to health care to Israel, Jews identify with Democrats on culture, values, and policy both in the domestic and international realms. The Trump presidency has led Jews to vote even more Democratic than at any time since we began our election night Jewish polling in 2010. For the past 8 years, we have seen a consistent bloc of 28-31 percent of Jews who vote for the Republican Congressional candidate, regardless of the political shifts impacting the broader American population during the turbulent elections of 2010, 2012, and 2016 when the political pendulum swung rapidly. But Trump, the rise of anti-Semitism, and the politics of the past two years have significantly altered the Jewish political landscape. American Jews voted for the Democratic candidate by a margin of 76 to 19 percent in the 2018 election, marking an increase for the Democrat by 16 net points compared to 2016 (when the Democratic candidate won the Jewish vote by a margin of 70 to 29 percent). The Jewish reaction to the Trump presidency and the major events that have taken place over the past two years is clear: American Jews do not like Trump’s policies, and they intensely dislike this President (18 percent favorable/74 percent unfavorable) whose rhetoric on race and immigration drives Jews even further away from Republicans. 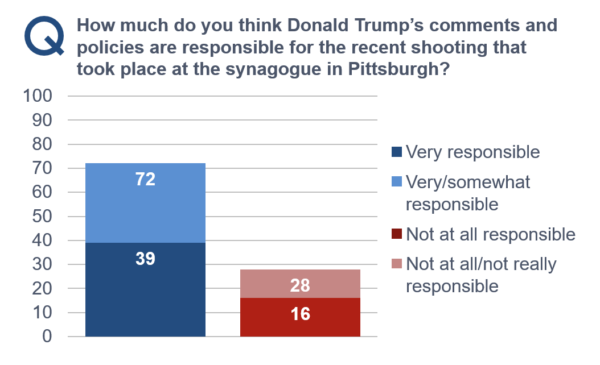 American Jews are more concerned about anti-Semitism in the age of Trump, and a shocking 72 percent even state that Trump’s comments and policies are “very or somewhat” responsible for the shooting at Tree of Life Synagogue in Pittsburgh. Click here to view the memo. Click here to view the toplines. Click here to view the crosstabs.